I’ve tried lithography, woodcut, linoleum cut, and etching (on a plastic plate, yuck! ), but have never succeeded as a printmaker. I would gladly do color lithography if I could have a press in my living room, but then I couldn’t paint. I have to say that intaglio printing was the hardest medium to master; I don’t know how many times I inked and wiped, inked and wiped, and sent it through the press before producing an acceptable print. Well, when I see accomplished printmakers, then I bow down in humility, because works like this just make me GREEN with envy. The key element of intaglio printmaking (including etching, engraving, drypoint, aquatint, and mezzotint) is that the ink rests in incised lines in the metal plate. After inking the plate, the excess ink on the surface must be wiped away. The plate is then put through a roller press which has great pressure that forces the paper into the incised lines thus creating the print. The mezzotint process begins by texturing a metal plate in such a way that it will hold a great deal of ink and print a solid black field. This is done with a tool called a "rocker." A rocker is essentially a large curved blade with very fine teeth along its edge. This blade is rocked back and forth, putting courses of fine dots into the metal plate. After this has been done repeatedly the plate will be covered with fine stipples that can hold ink. The next step is to scrape away the stippled texture where lighter passages are needed. The more the plate is scraped in certain areas the less ink it will hold and the whiter it will print. Mezzotint differs from other intaglio methods because the artist works from black to white rather than white to black. 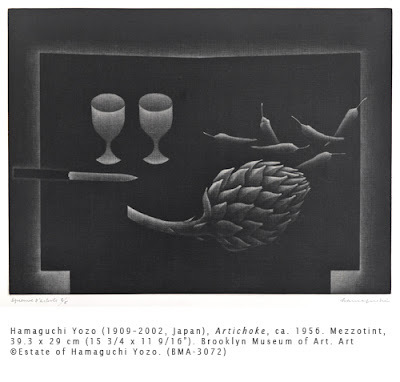 Hamaguchi Yozo (view more works here) is considered one of the masters of the mezzotint. He was born and studied art in Japan. After studying painting and sculpture in Tokyo, he abandoned that in 1930 and went to Paris where he studied printmaking processes. His skilled use of the rocker in his mezzotints creates a synthesis of Japanese and European art. While using an ostensibly western medium, he infuses it with the Japanese reverence for nature in his still life works, giving them an insubstantiality that suggests the transience of life, while also suggesting western surrealist compositions. Activity: Create an image of an individual object imitating the visual effects of a mezzotint. Using dark colored (black, brown, grey, or any dark color) construction paper, draw an image of a single object with one light color using chalk, pastel, or colored pencil. Make sure that the image is worked in the opposite from on white paper – establishing highlights with the light color and using the dark paper for shadow. 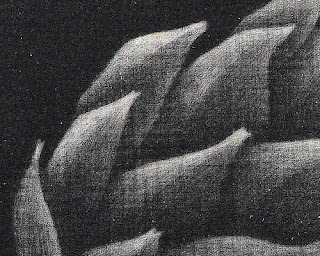 Blur the edges of the medium lines using a blending tool to imitate the soft quality of mezzotints. Correlations to Davis programs: Explorations in Art Grade 2: 5.27; Explorations in Art Grade 5: 2.7, 2.8; Exploring Visual Design: 3, 9. This type of printmaking is very unique. It's really good you are working on improving your own techniques. You are certainly doing great.